"Sampath Speaking" - the thoughts of an Insurer from Thiruvallikkeni: promising moon ... no 'Pocari Sweat' energy drink on moon !!! promising moon ... no 'Pocari Sweat' energy drink on moon !!! In this beautiful World, there is so much of media glare, so much of advertisements that determine and boost the sale of products … the mega sharks of marketing have ensured that IPL is played on Television and reach out to larger audience than to the gallery with host of innovations. In early days, at the end of over or at the fall of any wicket, you would have an expert voicing opinion. Who wants to hear all that when one can earn loads of revenue. Now we have advertisements in between the balls and any other possible slot. When a run out decision is pending, the screen fully aware that it is the place being watched by everyone runs mini commercials. As the bowler walks back to his run up, there are mini ads. There are things that baffle ….the other day on one FM broadcast, they were advertising for their brand …. ‘who is the target audience – somebody already listening ! – others anyway would not get to hear this ?’ …. Similarly, one wonders why advertise for products like say aeroplane tyres – are they simply surrogate advts ? ….. market innovation ?? In 2010, MRF were the official blimp sponsors …. Blimps ? … they were on on display during matches at Mumbai, Nagpur, Ahmedabad, Jaipur, Bangalore and Cuttack. The blimp was 19m long, had a diameter of seven metre, contained up to 400 cubic metre of pure helium when filled. Raising up to height of 300m and capable fo standing wind velocity of up to 40 knots during a storm, these were inflated balloons… now here is something on advertising on the ‘moon’ …. Locally, there jokes of keralite operating and offering ‘chai’ to Armstrong as he landed on the moon…. Perhaps that is to become real !! Red bull, Monster, Gatorade and more – from the old Glucon D … you have so many energy drinks and sports drinks, which sportsmen are shown as drinking attributing to their success, propelling the sales of such products. 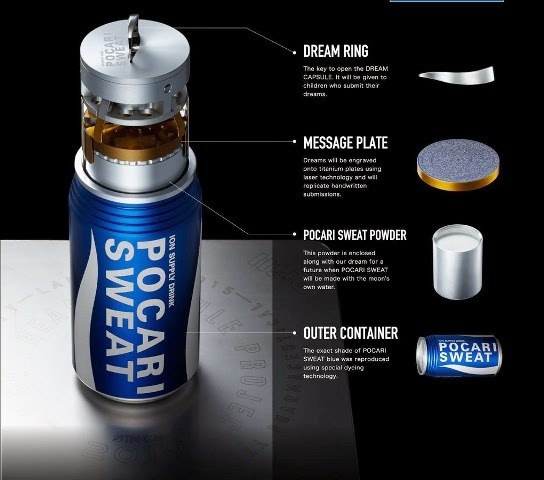 The one from Japan named "Poccari Sweat" is one of the go-to after-workout drinks, and now, by teaming up with Pittsburgh-based Astrobotic Technology Inc. and Singapore-based Astroscale, Pocari Sweat aims to extend its brand awareness, by becoming the first sports drink on the moon. Yes, the moon, that last bastion of advertising-free territory that we all assumed some soft drink major would get to first. The project will deliver a time capsule containing Pocari Sweat to the surface of the moon in October 2015. If successful, Pocari Sweat will be the first commercial beverage to land on the surface of the moon. Pocari Sweat is a popular Japanese soft drink and sports drink, manufactured by Otsuka Pharmaceutical Co., Ltd. It was launched in 1980, and is now also available in East Asia, Southeast Asia, and the Middle East. Pocari Sweat is a mild-tasting, relatively light, non-carbonated sweet beverage and is advertised as an "ion supply drink". It has a mild grapefruit flavor with little aftertaste. Ingredients listed are water, sugar, citric acid, trisodium citrate, sodium chloride, potassium chloride, calcium lactate, magnesium carbonate, and flavoring. It is sold in aluminium cans, PET bottles, and as a powder for mixing with water. The reference to sweat in the name of the beverage tends to have a certain off-putting or humorous connotation for native English speakers. However, the name was chosen by the manufacturers originally for the purpose of marketing the product as a sports drink in Japan, where English words are used differently. It was largely derived from the notion of what it is intended to supply to the drinker: all of the nutrients and electrolytes lost when sweating. The buzz is that the Japanese beverage company is planning to send the first advert on the Moon next year in the form of a soft drink and letters by children from across Asia. A one-kilogramme titanium container will be carried to the lunar surface aboard the first planned private Moon landing mission in October 2015. The canister will be filled with the Otsuka's powdered sports drink called Pocari Sweat, and letters sent by children from across Asia etched onto silver disks. The capsule will be conveyed to the moon by the Falcon 9 rocket. The Falcon 9, designed to be a potentially reusable means of space travel by Elon Musk's SpaceX, has already made three successful supply runs to the International Space Station, but the planned mission in October 2015 would be the first time one of its rockets has successfully provided propulsion to the moon. After the Falcon 9 rocket has ignited its second-stage boosters and completed a four-and-a-half day journey to the moon, the Pocari Sweat-branded canister will be deposited on the surface by private company Astrobotic Technology's "Griffin" lander. Pittsburgh-based Astrobotic Technology has more important reasons to be up on the moon than to leave a beverage can on its face. The company is angling to win Google's Lunar X prize, a $20-million bounty for the first company to land a device on the moon that can both travel 500 meters on the surface and transmit high-definition pictures back to Earth. Astrobotic's deal with Otsuka will provide them with funds to achieve this goal — the company reportedly charges upwards of half a million dollars for lunar delivery — but the mission to drop a can is somewhat ironic: Astrobotic is a company that develops technologies for clearing space trash.